What are the most popular online bachelor's degrees offered in Kansas? As one of 12 states in the Midwestern Higher Education Compact (MHEC), Kansas provides its students with a multitude of resources and support for online and distance education. The state's membership in MHEC translates to lower tuition rates, more opportunities for postsecondary education, and educational support for military veterans, among other benefits. As more and more jobs in the state require advanced degrees, Kansas has committed to increasing the percentage of higher degree-holding adults in the state to 60 percent by 2020, and MHEC's resources can help the state reach that goal. With these initiatives, Kansas aims to make online education more affordable and accessible for all students. Public higher education institutions in Kansas, including the state's six universities as well as community and technical colleges, can take advantage of the Kan-ed program, a high-speed, statewide network that provides video communication for online and distance learning and telemedicine. Historically, the Kan-ed program has also assisted in procuring grants and other funding for online education programs. Online colleges in Kansas give students greater opportunities to pursue higher education. While the state has lower-than-average degree completion rates, online learning programs can work to bridge that gap by providing increased flexibility, courses that can be completed at a students' preferred pace and the convenience of earning a degree from home. Offering a variety of fully online, asynchronous bachelor’s and master’s degrees, Ottawa University counts itself among the most versatile online colleges in Kansas. The university specializes in both arts and science degrees and in business programs. Undergraduates pursue degrees in addiction counseling, nursing, psychology, accounting, and business administration. Graduate degrees include addiction counseling, nursing, accountancy, human resources, and leadership. All students pay the same low tuition rate. Prospective undergraduate students must hold a bachelor’s degree or a GED and need to submit official transcripts. They must also schedule a conference with an admissions official prior to beginning the application process. Graduate candidates need a bachelor’s degree and must submit official transcripts with a GPA of 3.0 or higher, a personal statement, a resume, and three letters of reference. The Global Campus as Kansas State University offers more than 70 online programs, making the university one of the most accessible online schools in Kansas. Students interested in food studies and nutrition select among several undergraduate and graduate degrees, including the bachelor of science in dietetics, bachelor of science in food science and industry, bachelor of science in nutrition and health, master of science in agriculture, and master of agribusiness. Other programs include bachelor’s studies in education and business and master’s studies in chemical engineering, family and community services, and music. Admissions requirements vary by program. For undergraduate admission, applicants must submit official high school transcripts or GED scores and ACT or SAT scores. Transfer applicants must demonstrate a cumulative GPA of at least a 2.0. Prospective graduate students must hold a bachelor’s degree with a 3.0 GPA. Fort Hays State University is located in the heart of Kansas, between Denver and Kansas City. The Virtual College at Fort Hays offers more than 200 online programs specifically for adult learners. This includes programs in business, education, and nursing. Online education is a focal point at Fort Hays, with roughly 65% of students attending the Virtual College. Their students include adult learners who want to take a single course and graduate students pursuing a master’s degree. Fort Hays offers online programs at the associate, bachelor's, master's, and doctoral level. This school accepts transfer credits from regionally accredited colleges. All of Fort Hays' online programs are accredited. Wichita State University resides in the epicenter of Kansas’ commerce, medicine, culture, and entertainment scenes. With such close ties to a city that is a major player in the region, Wichita State is not your average college town. WSU offers several undergraduate and graduate degree programs in nursing, criminal justice, dental hygiene, education, and more. What truly sets WSU apart from the rest is their Online Badge Programs. Offered through the school’s Office for Workforce, Professional, and Community Education, Wichita State’s badge program makes workforce training accessible and affordable for today’s working professional. Wichita State University provides several online resource to online students through OneStop, a one-stop shop for almost anything a distant learner could want: academic assistance, financial aid, resources for adult learners and distance learners specifically, and military assistance. Pittsburg State University's 46 online degree programs, place a clear emphasis on technology. 18 of PSU's programs specialize in technology and its application in several different disciplines. Students can choose to study education, engineering, business, history, nursing, teaching, and more. The school also offers a master's degree in technology that has eight different majors. PSU is home to the Kansas Technology Center, a modern learning environment stocked with over 13 computer labs and 70 technical laboratories. One great resource for online students is The Writing Center at PSU, where students can meet with a writing tutor who will help them with any writing-related project. Appointments can be made in-person and online, allowing The Writing Center to serve all of PSU’s students. PSU's Gorilla Advantage Plan provides out-of-state residents in certain counties of Missouri, Oklahoma, and Arkansas eligibility for in-state tuition rates. Founded in 1863, Emporia State University has a long tradition of providing a high-quality educational experience for students across eastern Kansas. Emporia offers more than 31 graduate degree programs, as well as an interdisciplinary bachelor’s degree and several licensure programs online. Student also have the flexibility to attend classes offered at off-campus locations. Emporia State University offers several online resources to their distance students, including the graduate and distance student guide. The guide provides students with crucial information on the school’s academic resources, financial aid, tuition, scholarships, as well as a comprehensive list of student services and centers. Emporia is also home to the National Teachers Hall of Fame. Founded by the school in 1989, this nonprofit organization honors exceptional school teachers from across the country and immortalizes their accomplishments in their rich museum. Washburn University's goal is to make their distance learners feel connected to the school without ever having to set foot on campus. Washburn offers bachelor's degrees in health science, integrated studies, applied sciences in human services, applied science in technology administration, and criminal justice through their PLAN online degree completion program. The PLAN program allows Washburn students to study at qualifying community colleges in several states and to take classes online. Washburn has created an online education support page, which provides online students with resources on using D2L, discusses if online education is right for you, and provides resources related to course scheduling and registration. Through Washburn’s Interstate Tuition Waiver program, residents of Colorado, Missouri, Nebraska, Oklahoma, and Texas can all pay Kansas resident tuition as long as they maintain a 3.0 GPA. Based in Lawrence, the University of Kansas is the state’s largest institution of higher learning. KU is able to provide a wide variety of degree programs and resources that smaller schools couldn’t dream of. KU's online KU's schools of nursing and health professions are the best represented through its online program. The vast majority of KU’s 30+ degrees and certificates are graduate programs, with KU’s a few undergraduate programs acting primarily as a starting point for nursing students. There are also certificates in professional communication, world business culture, and military transition. The Military Transition certificate is designed to smoothly transition military personnel back into the civilian workforce. Online students at the University of Kansas can take full advantage of the Academic Achievement and Access Center, as well as academic advising and library services, and the KU Writing Center. Barclay College was founded by Quaker settlers in Haviland, Kansas in 1917. The school has grown much since then, but has managed to keep religion at the core of its identity. This shows in Barclay’s online degrees, including bachelor’s degrees in biblical studies and christian ministry leadership, and certificates in biblical studies, christian ministry, and friends ministry training. Students can also choose to study psychology or business.Barclay College charges a flat rate of $395 per credit hour for all courses, which keeps their programs affordable. Barclay requires students to complete 50-60 credits at another accredited university at a 2.0 average. Therefore, students coming straight out of high school would be best to acquire credits at an institution that will easily transfer credit to Barclay. Located in Winfield, Southwestern College boasts an impressive list of online undergraduate and graduate degrees and certification programs. Students can choose from degrees in business, education, healthcare and social sciences, ministry, security and safety, and technology. Southwestern College also offers a variety of undergraduate and graduate certificates and a certification preparation course for students who don't speak English as their first language. Academic Success Coaches (ASC) are one benefit that Southwestern College provides to their online students. ASCs are academic advisors who follow students throughout their entire academic journey. An ASC strives to go above and beyond other academic advisors by proactively contacting students and ensuring that students achieve their academic goals. Southwestern offers eight enrollment sessions per year, which provides online learners with incredible flexibility to attend either either part- or full-time without disrupting their lives. KCC is one of the most convenient Christian online colleges in Kansas. Students pursue either an associate or bachelor’s degree in religion with an emphasis in leadership and ministry without needing to visit the Overland Park campus. Tuition costs the same for all students irrespective of where they live. To facilitate convenience and intensive academic engagement, students take one course per five-week term. Asynchronous class delivery gives students flexibility, but learners must turn assignments in on time. Prospective students must provide official high school transcripts. The school exempts transfer applicants with more than 12 college credits from submitting high school transcripts, but they still must provide all college transcripts. All applicants submit a spiritual reference letter, and prospective transfer students submit a professional recommendation letter in addition to other application materials. MidAmerica Nazarene University is a young institution, founded in 1966. MidAmerica has a robust online degree program that offers a bachelor’s in business administration, RN-BSN, RN-MSN, and an accelerated associate of arts in business for undergraduate students. There are also master’s programs in business administration, education, and nursing in addition to certificates on similar subjects. MidAmerica’s online degree authorization is not standard across every state. There is no online degree authorization in Alabama, Maryland, Utah, and Wisconsin, and variation of availability in the remaining states. Prospective students should check to ensure that their online program will be available in their state. MidAmerica’s library is a great resource for online students. The library provides library database access, internet resources, research guides, and a Kansas library catalog. Named after Catholic Cardinal John Henry Cardinal Newman, it should be no surprise that theology studies are Newman University's speciality. Founded in 1933, Newman University now offers over 70 degree programs with a small 15-to-1 student-to-teacher ratio. The school's main campus in located in Wichita, with satellite locations in Western and Southeast Kansas, Colorado Springs, and Oklahoma City. Newman University’s three online degree programs include a BS in business online, a master’s of theological studies, and a master’s of arts in theology. Newman University’s theology studies are supplemented by the Gerber Institute for Catholic Studies. The Gerber Institute’s goal at Newman University is to promote interdisciplinary dialogue exploring Catholic thought and practice in regards to education, philosophy, politics, sociology, and cultural life. The Gerber Institute also provides grants and fellowship opportunities to students whose projects support and further the institute's mission. Based out of Leavenworth, University of Saint Mary started in 1923 as a two-year institution for young women to supplement the growing need to educate women past high school. Since then, the school has evolved into a full-fledged university with undergraduate and graduate degrees available on-campus and online. University of Saint Mary’s four online degree programs include an RN-BSN, an MBA, a master’s of science in nursing, and a bachelor’s of science in health information management. The master's in nursing degree offers two specializations: nurse educator and nurse administration. The MBA program is flexible, with seven different specializations to choose from. University of Saint Mary caters directly to their online students with their online student support team. This team is dedicated to working with the school’s online students, ready to provide assistance at any stage of the online education process. Our affordability methodology considers value-driven metrics and ranks schools that have low tuition rates, as well as proven graduation rates and employment outcomes that provide a high ROI for students. For students in Kansas, there are plenty of opportunities to find an affordable program locally. While distance education provides more flexibility than an exclusively residential curriculum, there are still plenty of advantages to attending a local online college, including access to lower tuition prices and local scholarships. If you're considering going back to school, and are thinking about studying online, the following list of cheap accredited online colleges in Kansas will help you start your search. Founded in 1966, MNU's three campuses across Kansas provide multiple pathways for students to earn their undergraduate and graduate degrees. In recent years, MNU has embraced online education, offering distance classes in an environment that promotes Christian values. Along with an RN to BSN option, the university offers an online bachelor's degree in business administration. Transfer students must have a 2.0 GPA or better and commit to earning 30 or more credit hours at MNU. All students, no matter their state of residence, pay the same tuition. Out-of-state students should check MNU's degree authorization page to confirm whether the school's programs have accreditation in their state of residence. Located in Topeka, Washburn University provides over 30 academic disciplines to students all over the world. WU offers degree completion programs in both online and hybrid formats in subjects such as human services, technology administration, health science, and criminal justice. The degrees are delivered asynchronously and can be completed on a part-time basis. Certificates are also available in medical sonography, health information technology, and radiation therapy. Students enrolled in these programs can complete practicums or internships in their home cities, even if they live outside of Kansas. Out-of-state students pay significantly higher tuition, but online students are exempt from certain fees. Located in Wichita, Newman University is one of the most accessible and affordable online colleges in Kansas. NU offers several online programs including a bachelor's degree in business and master's degrees in theology, business, and education. Students can earn an online master's degree in just 12 months. For programs that require practicum experience, NU works with students to ensure that they can complete these requirements in their local communities. All online students use Blackboard to complete assignments and communicate with their professors. NU offers tuition assistance to students finishing their education after spending time in the workforce. Online students, even those living out of state, pay less in tuition than on-campus students. Out of all the affordable online colleges in Kansas, Wichita State offers its students one of the broadest selections of online degrees. Aside from bachelor's degrees in business administration, criminal justice, and engineering technology, students can earn master's degrees in aging studies, public administration, and special education. WSU boasts personalized advising and a streamlined credit transfer process. In addition to these benefits, accepted students have access to an online student orientation and online tutoring. All students, no matter their state of residence, pay the same tuition. Online students can apply for merit-based scholarships that automatically renew each semester. FHSU extends much further than its Hays campus, offering over 50 online degrees to distance learners and working professionals. In addition to bachelor's degrees in areas such as accounting, geosciences, and philosophy, students can earn graduate degrees in business administration, education, and history. Certificates are also available in allied health, justice studies, and nursing. Degrees are offered in both fully online and hybrid formats. Out-of-state students pay a higher tuition rate than in-state residents. In addition to loans, FHSU offers many merit scholarships and grants reserved solely for online students. KU allows students from around the country to take advantage of over two dozen online programs. Students can earn bachelor's degrees in several fields including communication studies, psychology, and liberal arts. Several health-related undergraduate degrees are also offered in nursing, respiratory care, and health information management. Courses are available in both fully online and hybrid formats. Online courses are delivered asynchronously. Each online program has different requirements concerning transfer credit. Kansas residents pay a lower tuition rate than out-of-state residents. However, students can apply for KU's many scholarship opportunities regardless of residency status. Baker's 14 online bachelor's and master's programs focus on business and nursing, although degrees are also available in education, criminal justice, and liberal arts. For prospective students researching affordable online colleges in Kansas, BU offers a smart choice. All students, no matter their state of residence, pay the same tuition. BU accepts new students on a rolling basis throughout the year. Once accepted, online students access their courses through the Moodle learning platform, which allows them to interact with professors and classmates in real time. Completing an undergraduate program requires an average of two years, or longer if a student does not have transfer credit. Located on the border of Kansas and Missouri, PSU's 46 online programs include associate, bachelor's, master's, and doctoral degrees. Undergraduate students can study nursing or workforce development, while graduate students can choose from a host of options including education, engineering technology, and business administration. Transfer students must have earned at least a 2.0 GPA and 24 transferable college credits to apply to PSU. Incoming freshman can only apply for the fall semester. Tuition for in-state students is approximately half the tuition for out-of-state students. Despite such a vast difference in tuition, out-of-state students qualify for PSU's merit and transfer scholarships. The school also offers tuition assistance to students residing in certain southern states. The SC professional studies program provides students with a full suite of undergraduate and graduate options. The school offers 16 online undergraduate degrees in areas such as accounting, Christian ministries, and strategic leadership. There are also 10 online graduate programs in the categories of business, education, and ministry. Out of all the online colleges in Kansas, SC keeps the working professional in mind. All classes are six weeks long, and students can take courses asynchronously to fit their own busy schedules. Transfer students can take advantage of three options when applying to SC: applying already-earned credits, testing out of courses, or submitting a portfolio of professional work. All students pay the same tuition, but rates vary between graduate and undergraduate programs. ESU's online programs cater to distance learners of all ages and backgrounds. The school's bachelor's degree in interdisciplinary studies is available fully online, and students can complete master's degrees in areas such as art therapy, business education, and library science. The abundance of master's degree options makes ESU one of the most attractive affordable online colleges in Kansas for graduate students. Students living in the Emporia area can take advantage of courses offered in a hybrid format. Accepted students can start their programs in the spring, summer, or fall semesters. ESU calculates tuition based on the number of courses a student attempts each term Through its online mentoring program, ESU connects students to several scholarship opportunities. USM's online programs bring an affordable undergraduate or graduate education to students far beyond the university's Leavenworth campus. The school offers an RN to BSN program for registered nurses along with a bachelor's in health information management. Master's degrees are also available in nursing and business administration. Once accepted, all students pay the same tuition based on the number of credits they take each semester. USM offers many start dates throughout the year, giving students added flexibility when planning their education. For online students, USM provides technical and academic support to ensure their needs are being met. CCCK's online offerings include two associate degrees and five bachelor's programs in the arts, criminal justice, and business. Out of the many online colleges in Kansas, CCCK goes the extra mile by eliminating application fees. The college also exempts online students from other fees and provides some textbooks free of charge. CCCK accepts all transfer credits and associate degrees for students who attended accredited universities. The college reviews credits from non-accredited schools on a case-by-case basis. Courses are taught in an asynchronous format. All students pay the same tuition, and the college's financial aid department works closely with students to determine their eligibility for loans and scholarships. The online learning program at FU gives students tremendous flexibility to advance their education. With four bachelor's programs and five master's programs, learners can become experts in areas such as business management, computer information systems, and cybersecurity. When applying, prospective students can choose to begin in the spring, summer, or fall semesters. Asynchronous courses allow students work at their own pace using the Moodle learning platform. FU charges a flat-rate tuition each semester, so students save money by taking more classes each term. However, graduate programs are slightly more expensive than undergraduate programs. For continuing education students, FU charges per credit hour to accommodate part-time schedules. Tabor College's online programs provide working professionals and distance learners with many opportunities to further their education. Undergraduates can earn their degrees in areas such as business administration, nursing, and criminology, while graduate students can choose from disciplines such as executive leadership, informatics, and nurse education. Students can enroll any month of the year. Transfer students must have earned at least a 2.0 GPA. Full-time online students pay the same tuition as on-campus students. However, part-time online students pay based on the number of credits they attempt. Students living outside of Kansas pay the same tuition as in-state residents. BC is one of the most affordable online colleges in Kansas. Its online programs focus on religious instruction, business, and psychology. Courses begin every six weeks and are taught in an asynchronous format. Students applying to BC's online programs must have already completed at least 60 credit hours of coursework with a minimum 2.0 GPA. Once admitted, students can take advantage of a two-week online orientation that introduces them to the school's online instruction format. Students in their first term take only one course so that they can become familiar with the online learning environment. All students pay the same tuition based on the number of credit hours attempted. For online students, BC offers scholarships and helps students apply for federal loans and grants. As of 2012, 33,339 students attended distance learning programs exclusively in Kansas. The state offers 46 accredited online programs in higher education, which often have similar if not identical curriculums and access to the same campus faculty and staff. In 2013, the state expanded the use of broadband technology video communication for distance learning at its schools, libraries and hospitals through its Kan-ed program. In addition to its in-state online programs, Kansas is a member of the State Authorization Reciprocity Agreement (SARA), which allows students access to approved distance education courses and programs in other states. Students concerned about tuition should note that from 2012-2013, the average in-state tuition at public institutions was $6,970, well below the national average of $8,070. The state of Kansas values the proliferation of online education while providing it at an affordable rate. 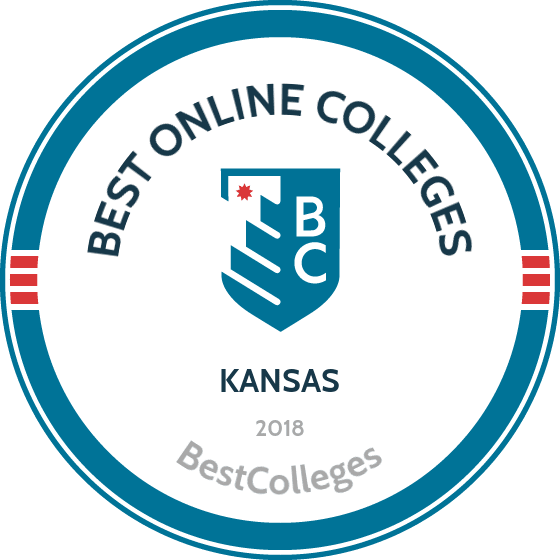 Browse our list of the best online colleges in Kansas for more insight into distance learning programs in this state. Recent NCES reports indicate that 13.8% (26,519) of undergraduate students enrolled in Kansas' Title IV institutions were in exclusively online programs. Employment growth in this profession is moderate in Kansas. According to the Kansas Department of Labor, long term projections show an increase of 13% in the total number of jobs between 2014 and 2024. Wages increased by 2% from 2011-2016. In 2016, what were the top careers in Kansas for people who had a degree in business administration and management? Data source: Kansas Department of Labor, Bureau of Labor Statistics. Data may not be available for every year. Employment growth in this profession is moderate in Kansas. According to the Kansas Department of Labor, long term projections show an increase of 14% in the total number of jobs between 2014 and 2024. Wages increased by 3% from 2011-2016. In 2016, what were the top careers in Kansas for people who had a degree in Registered Nursing? Employment growth in this profession is strong in Kansas. According to the Kansas Department of Labor, long term projections show an increase of 209% in the total number of jobs between 2014 and 2024. Wages increased by 13% from 2011-2016. In 2016, what were the top careers in Kansas for people who had a degree in Psychology? Employment growth in this profession is strong in Kansas. According to the Kansas Department of Labor, long term projections show an increase of 25% in the total number of jobs between 2014 and 2024. Wages increased by 5% from 2011-2016. In 2016, what were the top careers in Kansas for people who had a degree in accounting? Employment growth in this profession is strong in Kansas. According to the Kansas Department of Labor, long term projections show an increase of 21% in the total number of jobs between 2014 and 2024. Wages increased by 9% from 2011-2016. In 2016, what were the top careers in Kansas for people who had a degree in health care administration/management?